Are you thinking of giving someone an edible gift? You better prepare. There’s no shortage of food gift options that can spice up any special occasion. You can’t go wrong with a food gift whether you’re preparing for a birthday, anniversary, or even Mother’s Day. With all the care and effort you put into making food gifts just as much effort should go into the presentation. You want your gift wrap to be just as special as what’s inside. But how can you wrap your food in a fun and unique way? Here are our favorite food gift wrapping ideas. Mason jars have long been held delicious food items. You can use a jar whether you’re making a tasty jam or some homemade lemon curd. Your gift wrapping doesn’t have to be boring because you’re using a jar. You can lighten things up by giving your jar a label. Craft a label with fun fonts and designs. You can also give it an extra touch by adding a ribbon or bow to the lid. For extra creativity, consider writing a message and taping it to the jar. Not sure what you kind of label to make? Check out some custom labels online. No list of gift wrapping ideas is complete without referencing the gift bag. Gift bags are a great idea for anyone wrapping up smaller food. You can even use lunch sacks or brown bags. Make sure you decorate the bag with ribbons to give it some flair. You can also consider gluing on a custom tag. Add some color with paint pens to really make the gift bag shine. Let’s face it: we all have extra boxes lying around the house. Why not use them to your advantage? Boxes are a solid gift wrapping idea if you have cookies or baked treats. Simply find a small shoe box around the house or head to a local craft store. Add some tissue paper, stickers, ribbons, or other decorations to enhance the presentation. You should also pay close attention to the box size. Avoid choosing a box that is too big. It will make your gift appear small and insignificant. You want to make sure you are using space to give the illusion of size and importance. Looking to save some time and money? Wrapping your food in wax paper is one of the easiest and most economical gift wrapping ideas. Place small items like candy and baked goods on a baking sheet with wax paper. Cut the paper and wrap a little piece of it around each piece of food. This will show that you put extra special care into individually wrapping your food. You don’t have to wrap your food in wax paper. You can also use leftover towels or napkins. Bundle your food items together and wrap them in clean towels or napkins. You can then seal the gift by adding kitchen twine. It’s one of the most convenient ways to wrap your food while still looking presentable. 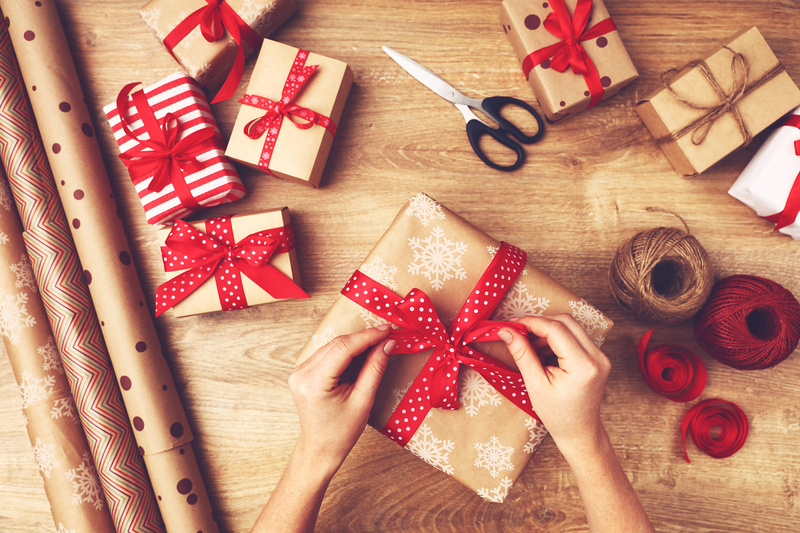 Are you looking for more gift wrapping methods? We can help. Check out our blog for more DIY projects for fun projects and home improvement.